Make a truly memorable and dignified first impression with this Old World European inspired desk. From the traditional cherry wood construction to the exquisite crown moulding, seed glass, and cremone door hardware, everything about this piece exudes sophistication. And you'll execute with expert efficiency thanks to a host of functionality features. A pullout desktop extends your work surface 7.5 inches for a full 18 inch work surface. The base credenza boasts storage for your printer and a hanging file drawer as well as an easy-access electrical outlet (with AC and USB ports). 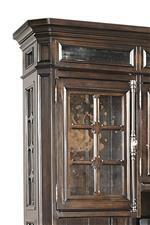 The hutch features traditional seeded glass doors and 3-way touch LED display lighting. Everything an executive needs and so much more. The Sheffield Traditional 75" Credenza Desk with LED Lighting and Electrical Outlets by Aspenhome at Conlin's Furniture in the Montana, North Dakota, South Dakota, Minnesota, and Wyoming area. Product availability may vary. Contact us for the most current availability on this product. I39-319 75" Credenza Hutch 1 76.75" 16.875" 54.5"
I39-321 75" Credenza Desk with sliding top & storage 1 75" 26" 38.75"
The Sheffield collection is a great option if you are looking for Traditional furniture in the Montana, North Dakota, South Dakota, Minnesota, and Wyoming area. Browse other items in the Sheffield collection from Conlin's Furniture in the Montana, North Dakota, South Dakota, Minnesota, and Wyoming area.